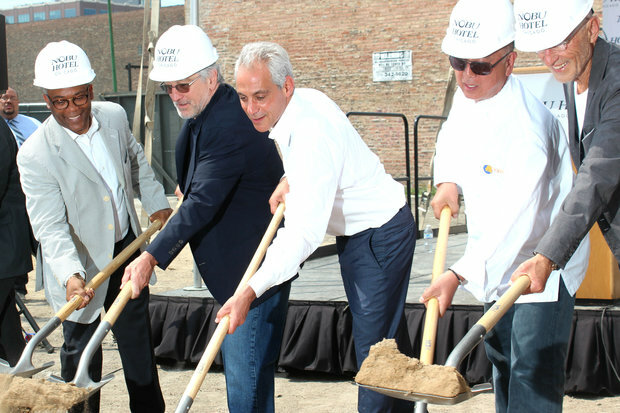 Actor Robert De Niro was in the West Loop Monday afternoon to break ground on the new Nobu Hotel project on Randolph. De Niro co-owns the Japanese-themed boutique hotel and restaurant chain. WEST LOOP — A-list actor Robert De Niro was in the West Loop Monday afternoon to break ground on the new Nobu Hotel project on Randolph. 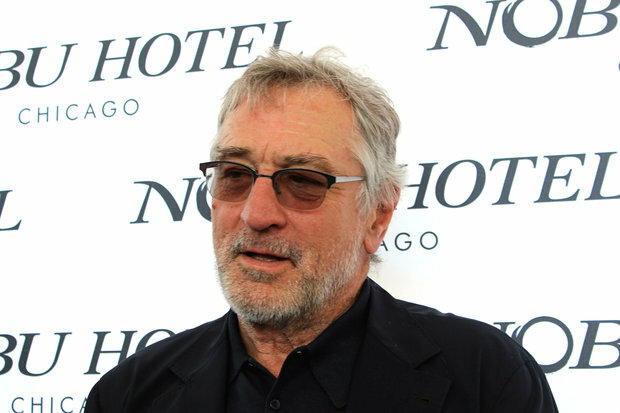 A two-time Academy Award winner, De Niro co-owns Nobu, a Japanese-themed boutique hotel and restaurant chain. The Chicago Nobu has been a decade in the making. The planned hotel at Peoria and Randolph streets will bring more than 100 new hotel rooms and a 10,000-square-foot restaurant and rooftop terrace to Randolph's restaurant row. The new hotel is slated to open in 2017. At a news conference Monday at the West Loop construction site, De Niro said this was his first trip back to Chicago in nearly 20 years. "I'd say I haven't been here in almost 20 years, when I shot some films here," De Niro said. When asked if he was surprised how much Chicago had changed in 20 years, De Niro responded: "That's what happens with cities. They change. New York changed so much, why would it not happen in Chicago?" During his one-day trip to Chicago, he reportedly stopped by Maple & Ash in the Gold Coast, too, before jetting back to New York City. Earlier this month, a hotel representative said the Chicago's Nobu Hotel would feature 83 rooms and eight stories. But leaked renderings of the Nobu project now show a taller 11-story hotel building, Curbed Chicago reports. The city's Department of Planning and Zoning was notified that a new zoning application could be introduced to City Council on Wednesday, department deputy commissioner Peter Strazzabosco confirmed Monday. "There has been no review or presentation to the city to date," Strazzabosco said. "If the application seeks to substantially amend or change the Planned Development zoning designation that was previously approved, the formal review process would include the Chicago Plan Commission and the City Council." The new hotel project is expected to create about 200 construction jobs and 100 permanent jobs when it opens. In addition to De Niro, chef Nobu Matsuhisa and film producer Meir Teper also own Nobu Hotel and Restaurant. Mark Hunt leads the group developing the hotel, according to zoning records.